Maria Anne Fitzherbert, (nee Smythe), was born 26th July 1756, the eldest child of Walter Smythe (d.1788), and his wife Mary (d.1807), the daughter of John Errington of Andover, Hampshire. Maria Fitzherbert was the unlawful wife of George IV, whom she married on the 15th December 1785. Their marriage was considered invalid under the Royal Marriages Act of 1772. Born to a well-established Catholic family, Maria spent her infant years in Branbridge, Hampshire, where her father, a former solider, held an estate. At the age of 12 she was sent to Paris to be educated at an English convent, and in July 1775 she married her first husband, Mr Edward Weld, a widower of Lulworth Castle, Dorsetshire. Weld died later that same year, leaving Maria a young widow of 18. In 1778 Maria was married again to Thomas Fitzherbert of Swynnerton, Staffordshire. Fitzherbert died three years later, on 7th May 1781, in Nice. Maria, widowed for the second time at the age of 25, was left with an annual stipend of £2000, along with Fitzherbert’s house in Park Street, Park Lane, London. It is believed that her first meeting with George Augustus Frederick, Prince of Wales (the future George IV), took place in 1780, when out for a carriage ride with her husband in Chiswick. They were later formally introduced in March 1784, after an evening at the opera, following which the Prince of Wales proceeded to ardently pursue Maria. When he found that she was unwilling to become his mistress, the young prince proposed marriage. As Maria was a practicing Catholic, this was prohibited by the Act of Settlement 1701 and the Act of Union 1707, both of which would exclude the heir from succeeding to the throne in the event of a Catholic union. Further to this, the Royal Marriages Act of 1772 prevented any descendant of George II from marrying without the reigning monarch’s consent if the individual were under the age of 25. Maria initially declined the prince’s proposal, but following drastic gestures on the prince’s behalf, she agreed to marriage in the presence of their mutual acquaintance Georgina Cavendish, the Duchess of Devonshire. Maria then promptly left the country to travel abroad, but after continued pleas from the Prince, alongside threats that he might quit England and join her on the continent, she agreed to honour her promise and returned to London in early December 1785. Subsequently on the 15th of December 1785 the couple were married in the drawing room of her house in Park Street, London. The marriage was conducted in great secrecy by the Prince’s chaplain in ordinary, the Rev. Robert Burt, witnessed by Maria’s brother John Smythe and her uncle Henry Errington. Few knew for certain whether a marriage had actually taken place, but Walpole records that as early as February 1786 there was much gossip surrounding the subject, how ‘passengers in the Streets, of all ranks, talk of it’, from ‘London to Rome’. Further to this, a codicil outlined an assurance previously obtained from the King that in the event the Prince should predecease her, Maria’s annuity, as his wife, would continue to be paid for the course of her lifetime. Following the Prince of Wales’ recovery he parted formally from Caroline of Brunswick, and by 1800 he had reconciled with Maria, with the couple residing principally in Brighton. Maria would describe the decade that followed to be their happiest, but following increasingly dissolute behaviour of the Prince, by 1810 they had parted once more. Following the establishment of an official regency in 1811, the Prince of Wales was said to have sought out Maria’s advice, and upon his death in 1830, he is thought to have been buried with her portrait. Following the death of George IV, Maria Fitzherbert worked alongside Arthur Wellesley, Duke of Wellington to destroy most of the correspondence relating to their relationship. She, however, reserved a small number of documents recording the marriage of 1785, including her marriage certificate and the Prince’s will of 1796, to be deposited with her bank at Coutts. Maria maintained very good relations with the Royal family. Indeed she was a close friend of Frederick Duke of York until his death in 1827, and, upon the death of George IV, his brother William IV was said to have offered her a title, which she declined. She was however a regular visitor to him and his family, when they happened to reside in Brighton. Maria Fitzherbert died 27th March 1837, at her home 55, The Steine, Brighton, and was buried in the church of St John the Baptist’s Church, where there is a monument to her by John Edward Carew. For considerable periods throughout her lifetime, Maria resided in Brighton, Sussex. Previously a fishing village, Brighton's growing popularity for sea bathing, alongside later ties to the royal family, had encouraged the town’s significant economic growth. In the summer of 1786, with increasingly mounting debts, the Prince of Wales decided to retire from Carlton House, London. Having frequently visited his uncle the Duke of Cumberland in Brighton from 1783, it was there he chose to develop his new residence. He promptly purchased Lord Egremont’s house for the construction of his Marine pavilion to the designs of Henry Holland, and leased a further property from Thomas Kemp Senior to reside in whilst it was built. Maria declared that she could not live openly with the Prince whilst their marriage was not publically acknowledged, and therefore a further property was found. ‘A pretty modest villa… a little house with green shutters’, separated from the Prince’s new residence ‘by a narrow strip of garden’. It is from this period that Robert Adam’s schemes for Mrs Fitzherbert are thought to date. Adam’s designs are for a previously altered building, with its east façade overlooking the Steine. The scheme makes proposals for an additional extension, and as Meile highlights, it provides a good example of how Brighton properties were adapted to accommodate the increasing number of visitors. From the winter of 1786 Robert Adam was working on a Brighton scheme for W. G. Hamilton, a friend and advisor to the Prince of Wales, and this is perhaps how he came to produce the Fitzherbert scheme. The Prince would previously have been familiar with Adam’s designs following his earlier commissions for the Prince’s uncle, the Duke of Cumberland. Bolton gives a possible date of c1786 for the scheme, coinciding with the royal party’s arrival in Brighton. Miele however proposes a slightly later date, from the spring of 1787, citing the Prince’s debt crisis of 1786 as providing potential delay. Indeed, this seems most likely, as this would coincide with the construction of Henry Holland’s Marine Pavilion, alongside Adam’s ongoing project for W.G. Hamilton. There is some debate as to whether this scheme was executed. 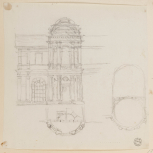 Bolton highlights the detailed nature of the designs, suggesting that they are working drawings for an executed scheme. He underlines the proposed use of timber for the means of rapid construction, (Adam volume 30/25), as also seen in Holland’s pavilion, suggesting the two projects were constructed concurrently. However there is no surviving evidence for its execution and McKean (ed.) argues that such a costly and elaborate project would have been an unlikely undertaking for Maria Fitzherbert at this time. It is not known conclusively for which site these designs were made. Steine house, the property remodelled for Maria Fitzherbert by William Porden, and in which she lived for a number of years, was purchased in 1804. These designs, therefore, relate to an earlier unknown residence in Brighton. Bolton suggests a possible location for a house close to the current North gate, a property subsequently absorbed by the surrounding Pavilion grounds. Alternatively Miele proposes a site immediately to the north of Marlborough House, citing an irregular ‘kick’ in Adam’s plan evident in a later ordnance survey. McKean (ed. ), however argues the designs are for Grove House, highlighting the longitudinal section (Adam volume 30/23) as a good match for the building’s exterior. Grove House, purchased by the Duke of Marlborough in 1790, also had an earlier association with the Royal family. Previously leased by the Duke of Cumberland, it is where the Prince of Wales stayed on his first visit to Brighton in 1783. Indeed the Prince would eventually purchase the house for himself in 1812, demolishing it to make way for his expanding pavilion. When considering the location of the site for which Adam’s scheme was intended, it is perhaps of interest to note that in the Prince’s will of 1796 he assigns to Maria ‘all the land in or about the Pavilion at Brighton, all the property and furniture in the Pavilion and in the next house to it’. It is possible that the ‘next house to it’ refers to the property in which Maria had previously resided, and the question arises as to which site this refers to, as by 1796 Grove House was in the possession of the Duke of Marlborough. It is possible that there was a form of understanding between the Duke and the royal family with regard to the use of Grove House, as they had previously resided there on visits to Brighton. This is perhaps further supported by the Prince’s eventual acquisition of the property in 1812.